To know definitively the exact moment of Christ's birth on Earth is to know the deepest and the most mysterious secrets and mysteries of Christianity. Many have, over the millennia, tried to answer this question to no avail. In fact they have confused the issue to the point of creating their own Gordian's Knot on this subject matter. Most noted of these are Raymond E. Brown's "THE BIRTH OF THE MESSIAH", and the "THE BIRTH OF CHRIST" by Liddon & Orr. There are literally hundreds of volumes and papers dealing with just this subject, as their thesis, that has come out before and after these above named references. None of them in anyway clarifies the issue to anyone's satisfaction. Below I will offer just one more argument as to the exact moment of Christ's Birth. In fact I believe the birth of Christ to be the central issue in Christianity because unless it is understood nothing else can be truly grasp concerning our religious beliefs. I must warn the reader that there are facts and evidence below that will seemingly have nothing to do with Christianity that will be called to bare witness on this issue. I will not take up pass arguments and disparage their authors. This argument below will shine a new light on the errors of previous efforts without referring to anyone in particular. No one has ever disputed the birth of John the Baptist that is known to have taken place on June 24th. In fact the Masonic Order has taken this date as their anniversary date. I will not go into the evidence that the Masons have, and keep a deep secret, that deals with our subject. That is a quagmire and conspiracy theory within itself. It is a bit unnerving to see the evidence of what the Masonic Order has done in the past and is still doing in modern times in their efforts to spread this esoteric system into the world. I'll hold off on that aspect of our discussion. I hold off on it not to keep it secret but because one would have to suspend his disbelief on other aspects of history in order to grasp what is being said. Also much of what I am going to say below encompasses a great deal of that information anyway. Let me first say here at the outset that history is merely a mythology to garment the word of God. Recent events in just the past hundred years demonstrate even in our own scientific era how difficult it is to get the facts straight. In my quest for history I am less concern with theories and hypotheticals then I am in concrete evidence that cannot be twisted to mean half a dozen different things. I happen to believe that the ancient scribes coded their understanding of the word of God in the sacred scriptures esoterically and the important aspects of history they left stable are insignificant to those that can destroy them if their importance was known. The date of John the Baptist's birth is a case in point on this issue. Every time the birth of Christ is discussed Johns part in the Nativity account gets little or no attention and his birth date is never mentioned. If Johns part is mention at all it is merely as an afterthought or a footnote to the discussion. We will deal with the year of the birth of John later in this paper. Now the date June 24th is precisely six months from the date of December 25th, which is the date of Christ's birth. Many dispute this date, of Christs birth, and we'll deal with that as we continue. So on this first point I have simply brought out and confirmed the New Testament's declaration concerning it. 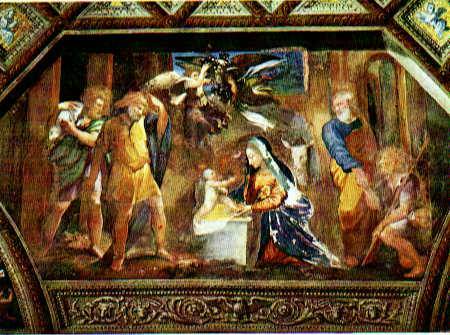 The angel speaking to Mary points out that her cousin Elisabeth is with child six months. The fact that John the Baptist was born on June 24th brings us to Judaism 'Circumcision Rite' which records the birth of every newborn male child. Eight days after the birth of the male child he is to be brought to the temple to have this rite performed on him. Eight days from June 24th is July 1st. This same ritual was performed on Christ as the New Testament recorded. If, therefore, Christ is circumcised according to the laws of Judaism his circumcision date had to be on January 1st. There can be no disputing the fact that July 1st and January 1st are six months apart. It would be thought that most people would accept the birth of the Messiah based upon this data alone. But some people point to ambiguous questions raised by the text of the New Testament that invokes their doubt. They also raise doubt in other people's minds when they do so. It is natural to raise questions when one does not know the answers but the student of the sacred scriptures is obligated to search for the answers himself and not just to raise havoc by trying to get others to do the work for him. The subject of the Magi (wise men) is the most important one that aids in defining this issue on the birth of Christ. This is because upon their evidence alone do we have a more definitive understanding concerning this issue. Most people believe that the Magi saw a star in the evening sky and they followed it. What a long (2-year) night that would have been. The New Testament does not say that. In fact the New Testament goes out of its way to point out that the Magi went to Jerusalem to speak to King Herod concerning the issue as to where the new born king was to be born. If the Magi were following a star in the night sky why would they stop, at Jerusalem, some six miles away from Bethlehem of Judea where the child laid in a manger? This is a confusing point in the New Testament for those that have not searched for the answer. In fact they should not know the answer because unlike the Magi they are not astrologers. The word Magi in Greek means 'astrologer'. And I will say, as was said in ancient times, unless you are yourself a Magi you will not know of the birth of Christ. In other words at least try to understand the rudiments of Astrology before you try to understand the secrets of the New Testament. Modern Christianity goes out of its way to trash Astrology. I agree with disregarding the fraudulent fortune telling aspect of Astrology but not the numerical and/or mythological aspects of it. Most Christians believe that the confusing issue, in the New Testament, is the Angel speaking to the shepherds guarding their flock, in the springtime, in contrast to the Christ child being born in the wintertime where the sheep would not be able to withstand the climate. Where actually unless the issue concerning the Magi is answered, where it is in doubt whether they actually saw a physical star in the sky or not, the issue of Christ's birth can not be answered. Can all of these seemingly contradictory points come together and be explained away? Yes, they can. What exactly is it that the Magi saw? If we are to accept the academic point of view which gives us numerous theories and at least a half dozen astronomical wonder taking place between 2 BC & 8 BC we would never understand the birth of Christ or what day he was born on. There would always be uncertainty in the mind of the Christian believer. Academia cannot survive as an institution without this kind of conflict to stoke its fires. King Herod having all the children killed from 2-years and under is an extraordinary piece of evidence because without it we could never know the precise moment of Christ's birth. It was the Magi, as recorded in Matthew's gospel, which gave that piece of information, about the star's 2-year duration, to King Herod. Now consider, what piece of information could the Magi have been privy to over a 2-year period that no one else could possibly know, but obviously was data that was part of the overall grand plan of God bringing his son to physical manifestation? In other words the Magi were following the star for at least two years. How we know this is because the conception, birth & circumcision dates of both John the Baptist and Jesus Christ account for most of this 2-year time. If we were to reverse the calendar, without even knowing the BC years involved, on both John the Baptist and Jesus Christ and went back nine months, in each case, to their conception dates we would find, at the very least, the divine plan would have span a 15-months duration. This means that from the moment that the angel spoke to Mary in the Annunciation, to the circumcision rite performed on Jesus Christ, 15-month passed. Based upon the storyline in the text we can obtain a sense of what took place during that 15-month period. All six events: the two conception dates, two birth dates, and the two circumcision dates, that had to have taken place concerning John the Baptist and Jesus Christ are recorded in the New Testament as having taken place. 1) The Annunciation to Zacharias (Luke 1:5-25;) John's conception date. 2) The Annunciation to Mary (Luke 1:26-38;) Jesus conception date. The Annunciation to Joseph (Matthew 1:18-25) After Jesus conception date. 3) Mary tends to Elisabeth (Luke 1:39-58;) John's birth date. 4) Zacharias and John at the temple (Luke 1: 59-80;) John's circumcision date. 5) Mary gives birth & the shepherds (Luke 2:1-20;) Jesus Christ's birth date. Mary gives birth & the Magi (Matthew 2:1-18;) Jesus Christ's birth date. 6) Jesus, Mary, & Joseph at the temple (Luke 2:21-39;) Jesus' circumcision date. A quick study of the above shows that Luke's gospel by far is the most informative on all six of these events. What is most interesting is that #5 demonstrates that one of these two gospel writers had to followed the format of the other. Notice how both have the birth of Jesus in their 2nd-chapter and talks of either the shepherds or the Magi in that chapter. What is most striking about Luke's gospel is the economy of space he uses after his prologue. Even this salutation gives a world of information to those that meditate on it properly. Luke goes from one point to the next without any frivolous information. Luke's agenda is obviously to bring out these six events in sequence. It is as if he is demanding that we give attention to these six points concerning the Nativity of Christ. There are some details at the tail end of these different segments but details, which germinate nuances, that are needed to be known by the reader in his meditations on these points. 5th) The significance of the words "House & Inn"
Another striking fact is that Matthew does not actually give us an account of the birth of Christ but just mentions the birth took place. His most important message seems to be the story of the Magi. He mentions nothing about the other five events mentioned in Luke's gospel. Another interesting point, and very important point is that Matthew uses the word "HOUSE" rather than "INN" in referring to where Jesus was born. Though Jesus was not born in the INN (according to Luke) the stable was part of the Inn and therefore could be incorporated in the wording. I am not apologizing for the wording here. I believe that Matthew says Christ was born in a "HOUSE" because he is more an airy type of person with his mathematics: his being a publican (tax collector), whereas, Luke is more intellectually materialistic being a doctor and knows the importance of detail information. The fact that the words "House & Inn" are both used indicates a concerted effort on the part of both Matthew & Luke to bring this information out esoterically. Both these words have mysterious mystical meanings in the first word of Genesis: Bereshith, which I deal with below. This cannot be a coincidence that this works out this way. Did Matthew & Luke agree amongst themselves to take one of the word and incorporate it into their text? This is most likely especially when you realize that John's gospel deals with the Nativity account also. And it also harmonizes with what Matthew & Luke does with these words. It must be known that according to the Catholic tradition each of the gospel writers took on the persona of one of the four beasts of the chariot that Ezekiel & St. John saw. Matthew represent the angelic man (Aquarius = air), Luke the Bull (Taurus = earth), Mark the Lion (Leo = fire), John the Eagle (Scorpio = water). Of course these are the FIXED Signs of the Zodiac in Astrology. What I am getting at here is that each of the four gospel writers were writing from their own particular mind set or astrological lens on the world. There are only four basic elements (Triplicities) in Astrology, and therefore four gospels in the canonized version. Any gospels written before or after these would still have to conform to the basic mystical tenets, connotations, and nuances of one of the four. Based upon our knowledge that John the Baptist was born on June 24th and Jesus was born on December 25th we can therefore calculate backwards to the conception dates and forward to the circumcision dates. The 15-month period needed to accomplish these events actually gives us the conception dates of both John the Baptist and Jesus Christ. For John the Baptist October 1st would have been his conception date and for Jesus Christ it would have been April 1st. April 1st, by the way, is traditionally, according to Judaism, the day creation came into being. This last would conform to Christian belief that Christ existed before time, and therefore, if he were to come into physical manifestation April 1st would be the most appropriate date in the calendar cycle for that to have taken place. It is my contention that Astrology is the spiritual language of the sacred scriptures. The fact that Christ was conceived on April 1st the beginning of the sign Aries, which I believe begins at the beginning of the month rather than two thirds into of the previous month demonstrates that Christ was born on a spiritual note, whereas, his Circumcision date where the procedure is not only painful it is perform at the beginning of Capricorn the month of Darkness (materialism). We know that most human births do not take nine months exactly though that is the general number used to refer to the birth of an individual. It varies according to the individual but it does range within the area of 9-months or 270-days give or take a few days. Most people think of 9-months as being 270-days. In John's case nine months would have been 275-days (October 1st to June 30th) and with Jesus Christ it was 276-days (April 1st to December 31st). This of course is calculating to the day before the circumcision dates and not the actual birth dates. 10th) "Born this day in the city of David"
Now consider the statement made by the angel to the shepherds tending their flock in the fields. "For unto you is born this day in the city of David a Savior which is Christ the Lord" this declaration by the angel to the shepherds refers to a new thousand-year period. The Psalms tells us that "a day is as a thousand years with the lord." I actually believe that the shepherds were the Magi. Two different authors, Matthew & Luke, describing the same people using two different words. They both used the words 'house & Inn' to describe where Jesus was born. Since the angel mentioned the 'city of David' this points to the Magi recognizing the Star of David in the calendar, which inform them of the birth of a newborn king. Since we already have evidence that Matthew & Luke has the tendency to use different words to describe the same event there is no reason to believe the shepherds are not the Magi. The Magi were aware of the immanent birth of the newborn king. Because the Magi are of the Gentile persuasion we can hypothesize that they understood the symbolism of what was going on. Therefore, they were ready with the Gold, Frankincense, and Myrrh: the trapping of the material world: Science, Theology, and Medicine. We see these same three temptations when Christ confronts Satan in the wilderness (of the mind) after his Baptism: food = medicine = myrrh, the pinnacle of the temple = theology = frankincense, bowing down to obtain the world = science (understanding the world) = Gold. For those that understand these three are one: the Sacred Scripture. The text is food for thought: Myrrh. It is a religious text: Frankincense, and it esoterically gives us knowledge of the world: Gold. How did the Magi know exactly when to come to the Nativity Scene? Remember it is a 2-year period. Why were they there on the precise night of the birth of Christ? They had to know of the mandate of Judaism to go into the #2: Beth, before any soul could enter the material world as ordained by the first letter of Genesis. Therefore, the Magi must have equated the #2 to two years and waited and arrived at the precise moment of the birth (Realistically though in Judaism every newborn male child has the potential of being the long expected Messiah. Judaism still waits for the coming of their Messiah. What actually is taking place is that the mother & father of the newborn child will offer their child everything the world has to offer (Gifts of the Magi). Yet, the Astrological influences (Magi) will also be present as the Keys to the sacred scriptures. The ancient maxim, "the stars impel they do not compel" is most appropriate here. For the child will either accept or reject the world. If he reject it then the influences of the sun, moon, and stars as ordained by the 4th Day of Creation will kick in bringing the light of the First Day of Creation to him. Therefore, he would become the Son of God: the Messiah. Saint John the evangelist refers to this in one of his letters when he says, "Now that we are the sons of God"). Matthew's gospel tells us of the Magi and Luke's gospel tells us of the shepherds. I see no contradiction here if one equates Magi as being shepherds of their flock. Can you imagine any sheepherder leaving his flock unattended? Shepherds were known to be excellent stargazer. So there is no discrepancy between the shepherds and the Magi stories. What is interesting is that in the final solution, concerning our question relating to the birth of Christ, the word 'David' as in "city of David" takes on a new significance. Anyone that has ever had the opportunity to be out at night for any duration of time and has looked up at the night sky cannot help seeing the stars traverse the dome of the heavens. I recommend this exercise to anyone that is interested. So it is not surprising that shepherds were considered astrologers in ancient times. Now consider how October 1st (conception of John the Baptist), April 1st (conception of Jesus of Christ), and July 1st (circumcision of John the Baptist), January 1st (circumcision of Christ) are all months/signs of the Zodiac known as the Cardinal Signs of Astrology. Again we touch on the profession of the Magi. There are only four Cardinal Signs of Astrology. Here each of them plays a prominent roll in the birth of Christ. Each of these Cardinal signs have a different element of creation: April/Aries = Fire, July/Cancer = Water, October/Libra = Air, January/Capricorn = Earth. This is now the second time I mentioned the Quadruplicities of Astrology. The Fixed Sign of Astrology I introduced to you via the four gospel writers where they were orientated to the Angel, Bull, Lion, and Eagle. This simply means that the gospels were written once and for all times. Meaning that they were not to be changed. They are stationary and permanent. Here in our discussion of the conception and circumcision dates of John the Baptist & Jesus Christ we see the four signs of the Cardinal Quadruplicities. Cardinal means to initiate or to start something. In both the conception dates and circumcision dates we see that occurring. Both John and Jesus are born in signs of Mutable Quadruplicities. The birth of the individual would appear as initiating the new child into the world but here they are seen in their life's work as communicators, which, in Astrology, the Gemini and Sagittarius signs are famous for. The point that I am bringing out here in this paragraph is that Astrology seems to dominate the Christian mythological story. The 12-disciples were thought of as the 12-signs of the Zodiac. I will not belabor the issue of Astrology in this paper but it is a factor in reasoning out our primary concern relating to the birth of Christ. Where in the BC era do these 15-months relating to John the Baptist and Jesus Christ belong? Too many questions come up in our discussion on the birth of Christ concerning the calendar. For example: when Jesus was conceived it took 269 days to reach December 25th, whereas we can not be sure of John the Baptist unless we know whether he was born in a leap year or not. When we talk of the calendar in Jesus' times we tend to equate the calendar as being equal to our own times. Is this justified? We must look at the calendar's origins for a moment to determine if we are on equal grounds here. If we don't answer our own questions we are merely batting our heads against the wall. Yes, we have to research the calendar year or we would never know if what the Bible is saying coincides with our understanding. If the Bible does not coincide with our understanding at least we will know what it is saying if we take the time to research it. On January 1st 46 BC Julius Caesar introduced the known world to a new calendar which he borrowed aspects of it from the Egyptian calendar. When he did this it had to be in conformity to the Summer & Winter Solstices and to the Equinoxes. It is interesting that the conception and birth dates of John the Baptist and Jesus Christ conform to these astronomical wonders. For example: when we take both John's & Jesus' birth dates and count the days between them it is the same as the Solstices. When we take the dates between the Equinoxes and compare them to the days between the conception dates of John and Jesus we find the days are the same. Coincidence? I doubt it seriously. If it was not for the Jewish tradition of the circumcision rite eight days after birth we may well have seen the conception and birth dates of John & Jesus on the Equinoxes and the Solstices. Another consideration that Caesar would have had to take into account, in positioning his calendar according to the astronomical data, is the Leap Year. We know that it comes once every four years because of the extra day. This is an accumulative effect from the totality of the four years. Every day during this period contribute a little bit to this one extra day every four years. Caesar would have had to clock his calendar in such a way that it would accomplish his goals. 17th) "Go into all the world and teach the Gospel"
We do not tend to think of the Roman Empire as having anything to do with the origins of Christianity. But the birth of the calendar on January 1st 46 BC is too precise to deny the guiding hand of the Roman Empire. Remember the Romans were Gentiles. Remember what Christ said, "Go into the whole world and teach the gospel," and another time he said, "be ye wise as serpents and harmless as doves". How does one teach a stubborn people (Jews) that do not want to know? This is certainly not accomplished as the Conquistadors did it in South America or the Zealot missionaries throughout North America and the South Sea Islands. Nor is it accomplished as we saw with the Holy Rose Wars. What the Romans did was the old magician's trick; they dazzled their audience (future generations) with the scenery (spectacular history) so they could pull a rabbit out of their hat, without the uninitiated knowing who did it, or how it was done. What, therefore, could Caesar's goals have been if he was the individual that initiated the Dawn of Christianity (Now in no way am I saying that Caesar created Christianity. Christianity, name and all, was a foregone conclusion after the penning of the first letter of Genesis. He who wrote the first letter of Genesis knew the entire content of the New Testament. We will see this more clearly when we get into John's gospel. History has been so contrived as to make it look like Caesar had nothing to do with Christianity. Now the real Julius Caesar may not have anything to do with it. But as far as we are concern Caesar is a fictional character in history. We have to suspend our disbelief just to consider him as a candidate for initiating the dawn of Christianity. We have to follow the clues that history has left us to follow. If we are unable to suspend our disbelief to follow those clues we can never learn what they are suggesting. Even if Caesar was an actual person aware of what he was doing he could do nothing of his own. He had to obey the mandates of the first letter, the first word of Genesis: Bereshith, and the first chapter of Genesis as a whole. This is the awe-inspiring part of his role in history. The fact that he conformed to the first letter of the Genesis' mandate demonstrates that he did have a conscious role in what was accomplished in 46 BC. Now I also realize that in order for these things to be true then someone else would have had to historically manipulate the historical data long after the events took place. The reason for this is because the BC Era did not exist conceptually until long after Christ was dead. Therefore, the so-called BC coin is discovered. There is no such thing as a BC coin because if you find a coin with BC on it you know it is a fraud. Yet, what I have suggested above is the BC coin. Hence you can see my reasoning in suggesting that Caesar is just a fictional character playing out a roll in history.)? initially given 30-days and February was given 29/30-days and the Solstices and Equinoxes did not have the same dates before the change as after the change on January 1st 8 BC, it all works itself out because the grand Lunar Cycle of 38-years brought the calendar back to its initial starting point to where the proper dates of the calendar could be instituted. This is a complex idea to get a mental grasp of but if one is willing to sit back and think it out it is a worthwhile endeavor. 2) Caesar would have had to wait for a year that allowed for the Christ to be born in the Leap Year. 3) He had to allow for his calculations to include not only the Solar Year but the Lunar Year as well in order to conform to the mandates of the first chapter of Genesis. We will see this last when we discuss John's Nativity account. 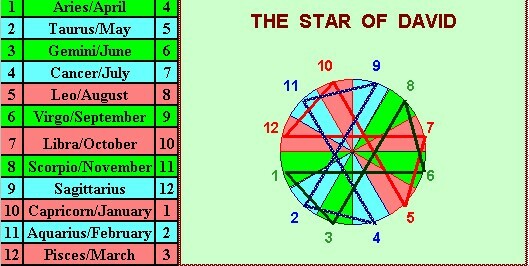 4) He had to allow for the calendar to be changed in 38-years (this incorporates the Solar & Lunar equations as mandated by Genesis chapter one) so that the Star of David would appear geometrically within the new design at that time. Christ came into the world. To save all mankind. We'll see this more clearly when we get into John's gospel concerning his Nativity account.). Julius Caesar would have been very careful as to when the calendar started and the Solstices, the Equinoxes, and the leap year were not just anything to flaunt. What Caesar done was merely to begin with March (beginning of the old Roman Calendar), which he gave 31-days, and he gave April 30-days, and he then alternated the two number '31 & 30' around the calendar until he came to February, which he gave 29-days on the common year and 30-days on the leap year. He also made January the beginning of the New Year rather than March. Julius Caesar would die on the Ides of March in 44 BC. Since Genesis chapter one is inundated with calendar mathematics it is obvious that it is an important issue to be looking into. This is the reason that the calendar is so much a part of the Dawn of Christianity and is intertwine with the birth of Christ. One other thing that should be said concerning the construction of this calendar: it is my belief based upon the historical data available that Julius Caesar knew of the error that would creep into the calendar as time went on and which was corrected in 1582 AD with the Gregorian calendar. The reason that I believe he left this error unattended to was because he wanted mankind to take another look at the calendar when the problem became too overbearing to deal with: possibly in the hopes that humanity would regain their spirituality. In continuing: 38-years after the inception of the calendar, to the date, on January 1st 8 BC the Roman Senate wanting to please Augustus Caesar changed the days of six of the 12-months (our present calendar's configuration). This is another nuance right out of the first word of Genesis: Bereshith. The Zohar tells us that Bereshith is two word combined: "bara shith = created six". The word "bara means, "choose, select, separated, created". Thus Bereshith can be interpreted: "bara shith = separated six". It is interesting that the Dogon tribe of Africa used the same terminology as the first verse of Genesis when it said "God helps". The word help is translated from the word "bara". It is said that the Dogon Tribe derived their knowledge from the Egyptians. Why would the Egyptians be using Hebrew words? What the Roman Senate did was to rename the month Sextile to August. Because July (named for Julius Caesar) had 31-days and August having only 30-days at the time the Roman Senate did not want to insult Augustus so they took a day out of February and gave it to August, a day was taken out of September and given to October, and a day was taken out of November and given to December. February then had 28-days on the common year and 29-days on the leap year. This reference to Julius month having 31-days and August having only 30-days and the Roman Senate not wanting to insult Augustus is quite a fanciful story. I only mention it because I wanted to show what nonsense could be thrown into the fray to confuse an issue. We will see that this is fanciful when we see the significance of the changing of the days of the six months. But of course the numbering of the calendar did change this way even though the mythology may be wrong as to what literally happened.